Conference Series LLC LTD invites all the participants from all over the world to attend "Global Blood Summit” during, October 7-8, 2019 in Paris, France. After the productive venture of series of hematology conferences around the globe ConferenceSeries llc Ltd is overwhelmed to welcome all the participants to CME Accrediated “Global Blood Summit” will held on October 7-8, 2019 at Paris, France.The CME Accredited conference is going to be organized round the theme " Assemble to Exploring Novel Trends in Treating and Terminate Blood Disorders.” which incorporates prompt keynote presentations, Oral talks, Poster displays and Exhibitions. CME Accredited Euro Blood 2019 is twelfth successive conference of Hematology Conference series that is a global platform to discuss and learn about Hematology, Blood Disorders, Hematologic Oncology, Hematologic Disorders, Immunohematology, Blood Disorders: Diagnosis & Treatment, Clinical and Experimental Hematology, Hematopathology, Pediatric Heamtology, Veterinary Hematology, Hematology Nursing, Stem Cell Research and much more. This Global Blood Summit will be organized around the theme: "Assemble to Exploring Novel Trends in Treating and Terminate Blood Disorders". This is an event that brings together active researchers, intellectuals, academicians, students, contributors and industrialists to exchange ideas communicate and discuss research findings on new advancements in all kinds of available Blood therapies worldwide .This is a two day multidisciplinary meeting covering all aspects of Blood Disorders and Therapies , including clinical service delivery, management, informatics and research. A blood cell disorder is a condition in which there's a problem with your red blood cells, white blood cells, or the smaller circulating cells called platelets, which are critical for clot formation. All three cell types form in the bone marrow, which is the soft tissue inside your bones. Common blood disorders include anemia, bleeding disorders such as hemophilia, blood clots, and blood cancers such as leukemia, lymphoma, and myeloma. Talking to your doctor is the first step to take if you believe you may have a blood condition. With members from around the world focused on learning about Haematologists, Chemotherapists, Oncologists; this is your best opportunity to reach the largest assemblage of participants from the Haematologists community, Haematologists society, European Haematology Conferences, American Haematology society. Conduct presentations, distribute information, meet with current and potential scientists, make a splash with new drug developments, and receive name recognition at this 2-days event. World-renowned speakers, the most recent techniques, developments, and the newest updates in Haematology are hallmarks of this conference. Hematology the branch of medicine that treats blood disorders and diseases which includes various research areas like clinical laboratory, hematopathology studies, physiology of blood cells immunology, pediatric hematology. 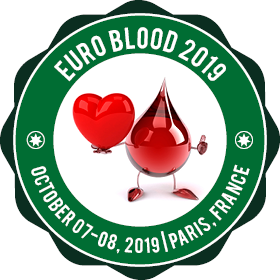 Euro Blood 2019 will be center of interest in various research areas related to hematology and it involves wide range of medical streams this will be best platform for exhibiting your research works, interdisciplinary interactions and sharing of knowledge. The organizing committee equipping for an exciting and informative conference giving space for plenipotentiary lectures, symposia, poster presentations, workshops on wide ranging concepts of Blood and gearing up various programs for participants from all over the world. We look for you to us at Global Blood Summit, Rome, Italy. We are sure you will have a meaningful experience with speakers, scholars and researchers from around the globe. All the members and organizing committee of Euro Blood 2019 look forward to meeting you in Rome, Italy. Euro Blood 2019 accredit to proffer the best stage for the abilities, researches, specialists and business delegates with its well-planned program covering each moment insight about haematology and blood disorders from the root causes behind blood ailments to the most best therapies in treating blood disorders and diseases this world congress is to give a breakthrough for innovative weapon against incessant clutters such as Thalassemia’s, lymphomas, biomarkers in blood and counter acting agents and antigen responses and to examine the immunological properties of blood which gives knowledge about the root causes. Paris is the capital city of France commonly known as the city of lights. Paris is a world-famous tourist destination with total population of about 2.2 million and a multicultural hub in the European region. Paris is the second largest metropolitan area in the Europe sharing one fifth of the total European population. Paris has established itself as a world-famous destination of tourists, arts, culture, philosophy and science. Paris is well known for its architectural marvellous, modern city planning, parks, monuments, elegant cuisine, and museums. The river of Seine divides the city into two parts and is famous for the cruise throughout the years attracting millions of foreign tourists. By economy, France ranked world’s ninth and Europe’s second largest economy in terms of purchasing power parity. Paris is the hub to 29, among world fortune 500 companies. The major economy is based on commerce, service industry, constructions and transportation industry. Paris is considered as the cultural capital of the world with an oceanic climate. During summer Paris is warm and winter is cool with a moderate rainfall in whole years make the climate very pleasant. The most attractive place of Paris is Eiffel Tower, Louvre museum, Musée d'Orsay, Champs-Élysées, Arch de trump etc. Major economy generated from tourism sector attracting around 85 million of tourist per year. Delightful French landscapes, diverse culture and spectacular scenery makes the visitors delightful. The French education system is highly organised and divided into primary, secondary and higher education. A quarter of the population are directly involved in the education system. Higher education in France is characterized by low cost and high quality of research. The city of Paris is well connected by bus service, metro, rail, trams and airport. Public transport is very convenient to roam around the Paris. The public transportation system in Paris is operated by RATP which is a combination of Subway (Metro), Bus, trams and railway (RER). The metro and public transport is very convenient and pedestrian friendly walkways are the great mediums to walk around the city. Paris is well connected globally with airways. Charles de Gaulle Airport (CDG) is the main international gate way to Paris. Including CDG airport, there are other airports like Orly Airport (second international airport), Beauvais-Tille Airport, Paris–Le Bourget Airport, and Chalons Vatry Airport. The Hematology market in Asia and the middle East is doubling in digits and remains to grown on in the upcoming years. The Americas controlled the huge share of 41.75% of Hematology throughout the worldwide and can be predicted up to $1,810.4 million in 2013, expected to reach $2,479.05 million by 2019, at a CAGR of 6% from 2013 to 2019. Europe is controlling the second largest market share of hematology. Germany is controlling a share of almost 20%. Hematology market in Europe expected to $272.8 million in 2013 and is estimated to grasp over $349.7 million by 2019, at a CAGR of 5.4% from 2013 to 2019. China controlling the largest share of 53% of hematology in Asia and an expected market of $216.0 million in 2013, estimated to earn over $429.1 million by 2019, at a CAGR of 15.4% from 2013 to 2019. Hematology in the sense haematology. The word heme came from Greek which mean blood. hematology is the science which deals with blood and its disorders and blood forming organs and this science includes the diagnosis, treatment, prevention towards diseases related to blood and malignance’s like haemophilia, leukaemia, lymphoma and sickle-cell anaemia. Hematology mainly focused on blood components like blood cells, haemoglobin, blood proteins, bone marrow, spleen and coagulation mechanism. Hematologists makes sure of blood levels if the levels either highly elevated nor depleted physician go with bone marrow aspiration. Varying or low rates of synthesis in haemoglobin leads to anaemia and also bleeding disorders and failure of coagulation mechanism, polycythaemia a disease condition where we can observe elevation of red blood cells Hematologists treat this state by employing phlebotomy taking the root cause into consideration that is reducing the haematocrit levels all these conditions come under hematopathology. Physicians who work on treating hematologic disorders, referred to as Hematologists. Some Hematologists also maintains laboratory who were referred hematopathologists they work on to formulate the best diagnosis for treating hematologic disorders, in some cases Hematologists as well hematopathologists both work in conjugation for giving the best therapy. Hematology-oncology is the science applied to treat blood disorders and diseases and(hematology) and cancers (oncology). Also, it treats with blood cancers and some disease include iron deficiency anaemia, thalassemia’s as well other organ cancers. Bone marrow cancers concerns with leukaemia’s in which WBC cancer takes place in this condition bone marrow synthesis other blood cells, initiating to bone tumours state referred to as multiple myeloma in this abnormal protein were created leading kidney dysfunction and can be identified by some symptoms like bone pain, frequent bone breaking and also constipation sometimes, mostly patients with the treatments like chemotherapy, radiation, plasmapheresis. The treatment will vary for individual suffering with myeloma based on many factors, in this multiple myeloma it includes a stage referred smoldering stage in which it doesn’t show active symptoms that is the state in which myeloma cells present in the body were not progressive. Initially for detecting the blood disorders bone marrow biopsy will be carried out which involves the study of cytogenetics and surface proteins on bone marrow cells and this study process referred to be flow cytometry. Treating of blood disorder may vary for every particular disorder, this can include use of coagulation factor support, immune modulating therapies, chemotherapy, bone marrow transplantation palliative care must be taken for the patients with complex disorder. Antithrombic are the class of drugs that works in preventing coagulation of blood which can be used in haemodialysis. in preventive measure for life threatening pulmonary emboli cases interventional radiologists implant vena cava filter by the help of ionizing radiation. Generally, through physical examinations, medical reports are used to detect the disorders by physicians to initiate the best therapy. Blood transfusion is the process of receiving whole blood or blood products into one’s systemic circulation intravenously. Transfusion may include injection of whole blood or components such as red blood cells, white blood cells, plasma, platelets or clotting factors. Blood transfusion is usually done in cases of deficiencies, to increase the oxygen saturation, during accidents or during surgery, to treat hematologic conditions such as severe anaemia, leukaemia, and sickle cell disease. Blood transfusion may also be associated with various complications including infections, immunological disorders such as haemolysis or incompatibilities. Hence a very systematic protocol is followed for blood transfusion which includes processing and testing the donor’s blood for possible infectious disorders, particularly for viruses such as Hepatitis B and C, HIV, and West Nile Virus., compatibility testing and hemovigilance. The system should include monitoring, identification, reporting, investigation and analysis of adverse events near-misses and reactions related to transfusion and manufacturing. Research and advances in this area of Haematology is hence considered a very important aspect. Graft versus Host disease (GVHD). Stem cell research deals with research and publication of high quality manuscripts related to stem cells. Stem cells are cells of multicellular organisms that can differentiate into other types of cells. They can divide more cells of the same type of stem cells. For a cell to be considered a stem cell, it should be self-renewing and must be either totipotent or pluripotent. Various types of stem cells such as embryonic stem cells, foetal and adult stem cells tissue specific stem cells, haemopoietic stem cells, cancer stem cells are known. Haemopoietic stem cells that give rise to other blood cells by a process called Hemopoiesis in the red bone marrow. Haemopoietic stem cell transplants are used in the treatment of cancers and other immune system disorders. Different types of stem cells. The theme of hematologic ailment is massive, counting disorders of cellular component extremes, insufficiencies or ruin, and dysfunction. Most of the ailments may lead to neurologic impediment. Some of these conditions are very specific to the hematologic complaint Anemia whereas others are common to numerous circumstances like hyperviscosity syndrome perceived with macroglobulinemia and leukemias. This session deals with Hematologic and their associated neurologic disorders. Haematology nursing is a different aspect in nursing where assistance and care for patients with blood diseases and disorders is dealt with. Haematology nurses may also assist in blood tests, transfusions, chemotherapy and other diagnostic and treatments related to blood such as leukaemia, lymphoma, sickle cell anaemia, Hodgkin’s disease and haemophilia. A haematology nurse has responsibilities very similar to an oncology nurse. Haematology nurses involve in both direct and indirect patient care. Direct care involves diagnostic and treatment aspects. Indirect patient care involves information collection and record keeping. Special training is required for Haematology nursing. This training is essential for dealing with sensitive issues such as IV infusions, catheter insertion etc. Haematology is a broad concept which deals with topics ranging from haematopoiesis (production of blood cells) to laboratory diagnosis of various diseases through the study of blood. Veterinary Haematology deals with all these aspects of Haematology in animals. Veterinary Haematology is important as there are significant differences in the blood cells of animals from human beings. Mammals have anucleate platelets and erythrocytes while birds and reptiles have nucleus cells. Size of the erythrocytes is also different in different animals. Different mammals have unique responses to inflammation. These differences make the assessment of blood and diagnosis of blood disorders more difficult than mammals, particularly human beings. So study of haematological characteristics of animals is important in diagnosing the disease. In poultry, dairy, meat and other industries involving animals such as sericulture, early diagnosis of these disorders is important in preventing huge financial losses. Veterinary haematology is also important to diagnose, and control infections spread to humans from animals. Animal case studies and reports. Polymerase chain reaction (PCR) is a technique used in molecular biology to amplify a single or a few copies of a segment of DNA across several orders of magnitude, generating many copies of a particular DNA sequence. PCR has rapidly become an invaluable technique for the detection and clinical management of a wide variety of haematological disorders. It provides a rapid method for the generation of large quantities of relatively pure DNA sequences of interest. This facilitates nucleotide sequence analysis in both normal and pathological haemopoietic populations. It also aids in the characterisation of normal molecular organisation and of inherited and acquired genetic defects. The extreme sensitivity of detection of rare genetic events has greatly improved the ability to detect minimal residual malignancy and low levels of viral infection. PCR is more advanced in that genetically modifies abnormal cells can be detected within a normal cell population at far low incidence level than any other existing technology. Advancements in PCR help in Detection of Mutated Genes, Detection of Chromosomal Translocations, Detection of Gene Expression, Detection of Clonality and sequencing. Anaemia is a condition in which you don't have enough healthy red blood cells to carry adequate oxygen to the body's tissues. Having anaemia may make you feel tired and weak. There are many forms of anaemia, each with its own cause. Anaemia can be temporary or long term, and it can range from mild to severe. Myeloma, also known as multiple myeloma, is a blood cancer arising from plasma cells. At any one time there are around 17,500 people living with myeloma in the UK. It accounts for 15 per cent of blood cancers, and two per cent of all cancers. Myeloma mainly affects those over the age of 65, however it has been diagnosed in people as young as 20. Haemostasis or haemostasis is a process which causes bleeding to stop, meaning to keep blood within a damaged blood vessel. It is the first stage of wound healing. This involves coagulation, blood changing from a liquid to a gel. Intact blood vessels are central to moderating blood's tendency to form clots. Coagulopathy (also called a bleeding disorder) is a condition in which the blood's ability to coagulate (form clots) is impaired. This condition can cause a tendency toward prolonged or excessive bleeding (bleeding diathesis), which may occur spontaneously or following an injury or medical and dental procedures. Leukaemia is a cancer which starts in blood-forming tissue, usually the bone marrow. It leads to the over-production of abnormal white blood cells, the part of the immune system which defends the body against infection. Platelets are tiny blood cells that help your body form clots to stop bleeding. If one of your blood vessels gets damaged, it sends out signals that are picked up by platelets. The platelets then rush to the site of damage and form a plug, or clot, to repair the damage. Human immunodeficiency virus infection and acquired immune deficiency syndrome (HIV/AIDS) is a spectrum of conditions caused by infection with the human immunodeficiency virus (HIV). A person may not notice any symptoms or may experience a brief period of influenza-like illness. Typically, this is followed by a prolonged period with no symptoms. As the infection progresses, it interferes more with the immune system, increasing the risk of developing common infections such as tuberculosis, as well as other opportunistic infections, and tumours that rarely affect people who have uncompromised immune systems. These late symptoms of infection are referred to as acquired immunodeficiency syndrome (AIDS) This stage is often also associated with unintended weight loss. Thalassemia is a blood disorder passed down through families (inherited) in which the body makes an abnormal form or inadequate amount of hemoglobin. Hemoglobin is the protein in red blood cells that carries oxygen. The disorder results in large numbers of red blood cells being destroyed, which leads to anaemia. A syndrome is a set of medical signs and symptoms that are correlated with each other and, often, with a particular disease or disorder. The word derives from the Greek σύνδρομον, meaning "concurrence".In some instances, a syndrome is so closely linked with a pathogenesis or cause that the words syndrome, disease, and disorder end up being used interchangeably for them. This is especially true of inherited syndromes. For example, Down syndrome, Wolf–Hirschhorn syndrome, and Andersen syndrome are disorders with known pathogeneses, so each is more than just a set of signs and symptoms, despite the syndrome nomenclature. In other instances, a syndrome is not specific to only one disease. For example, toxic shock syndrome can be caused by various toxins; premotor syndrome can be caused by various brain lesions; and premenstrual syndrome is not a disease but simply a set of symptoms. Clinical and Experimental Medicine publishes reports of clinical and experimental work concerned with the following fields: clinical chemistry, hematology, immunology, oncology and virology. The major criteria for publication will be clarity, experimental soundness and advances in knowledge. Papers containing new clinical or experimental data, or which are likely to contribute to changes in clinical practice or in thinking about a disease will be given priority due to their immediate importance. Adancing novel therapeutic agents for the treatment of malignancy into the marketplace is an increasingly costly and lengthy process. As such, new strategies for drug discovery are needed. Drug repurposing represents an opportunity to rapidly advance new therapeutic strategies into clinical trials at a relatively low cost. Known on-patent or off-patent drugs with unrecognized anticancer activity can be rapidly advanced into clinical testing for this new indication by leveraging their known pharmacology, pharmacokinetics, and toxicology. Using this approach, academic groups can participate in the drug discovery field and smaller biotechnology companies can “de-risk” early-stage drug discovery projects. Here, several scientific approaches used to identify drug repurposing opportunities are highlighted, with a focus on hematologic malignancies. In addition, a discussion of the regulatory issues that are unique to drug repurposing and how they impact developing old drugs for new indications is included. Finally, the mechanisms to enhance drug repurposing through increased collaborations between academia, industry, and non-profit charitable organizations are discussed. Thrombocytopenia is a condition in which you have a low blood platelet count. Platelets (thrombocytes) are colorless blood cells that help blood clot. Platelets stop bleeding by clumping and forming plugs in blood vessel injuries. Examples include pregnancy, altitude or medication side effects. Thrombocytopenia often occurs as a result of a separate disorder, such as leukemia or an immune system problem. Or it can be a side effect of taking certain medications. It affects both children and adults. Case Reports in Hematology is a peer-reviewed, Open Access journal that publishes case reports and case series in all areas of hematology, including general hematology, pathology, and oncology, with a specific focus on lymphomas and leukemias. Case Reports in Hematology is archived in Portico, which provides permanent archiving for electronic scholarly journals, as well as via the LOCKSS initiative. It operates a fully open access publishing model which allows open global access to its published content. This model is supported through Article Processing Charges. About the Hematologic Oncology Treatment Center. The Center for Hematologic Oncology provides specialized care for all types of cancers of the blood, including leukemia, lymphoma, multiple myeloma and Waldenström's macroglobulinemia, as well as related disorders of the blood, such as aplastic anemia and myelodysplasia.